It's Time for a Better Dry Cleaning Experience! At Yorgey's Fine Dry Cleaning we know you have better things to do than worry about your dry cleaning. You want a quality, hassle-free cleaning service at a fair price. And that's just what Yorgey's Fine Dry Cleaning delivers! At Yorgey's Fine Dry Cleaning You'll Enjoy Quality Cleaning Services You Can Count On! See our Services page for additional information and pricing details. We work very hard to make our customers happy and satisfied, and look forward to working even harder for you. Our experienced staff is constantly striving for consistent dry cleaning of the highest quality, with prompt, personal, and dependable service. 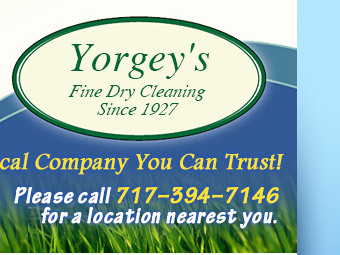 Ready to experience the Yorgey's Fine Dry Cleaning difference? Check out our locations page to find the Yorgey's Fine Dry Cleaning nearest you, fill out our convenient contact form to arrange your next pickup and delivery, or call (717)394-7146 today! Your satisfaction awaits! Yorgey's Fine Dry Cleaning has been voted "Best" or "Favorite" Dry Cleaner in Lancaster by every major survey since each survey began. © 2019, Yorgey's Fine Dry Cleaning. All Rights Reserved. This site's web design and hosting services provided by EZMarketing, Lancaster, PA.